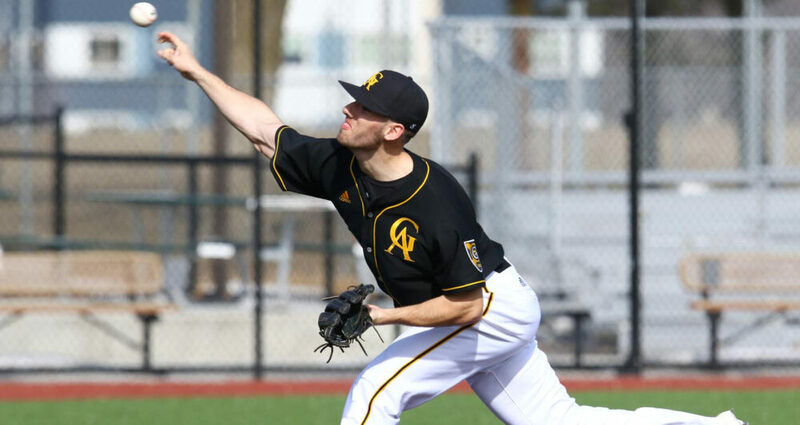 MANKATO, Minn. – The Gustavus baseball team Saturday completed a doubleheader sweep over Bethany Lutheran at Franklin Rogers Park. The Gusties took game one 8-1 followed by a 6-2 victory in the nightcap, improving to 7-3 overall. After a scoreless first inning, the Gusties erupted for five runs in the second which proved to be more than enough. Grant Brockhouse (Sr., Urbandale, Iowa) hit a bases-loaded infield single to score the first run, followed by a two-run double off the bat of Dexter Leer (Sr., Owatonna, Minn.). Brice Panning (Jr., Hamburg, Minn.) ensued with an RBI groundout and Carter Clemensen (So., Cologne, Minn.) capped the frame with an RBI double. The Gusties added one more run in the third on an RBI double by Brockhouse. The Vikings ended the shutout inn the bottom half after a single, stolen base, and RBI hit, but that would be all the offense for the home team. Sam Archer (Sr., Zimmerman, Minn.) closed out the scoring in the seventh with a two-run homer. Adam Stockwell (Sr., Apple Valley, Minn.) earned the mound win after five innings of work. He gave up one run on five hits with eight strikeouts and a walk. Weston Lombard (So., Stillwater, Minn.) tossed scoreless sixth and seventh innings with a pair of strikeouts and no hits. Archer led the team at the plate, batting 2-for-3 with three runs, two RBI, a double, and a home run. Two scoreless innings passed before the Gustie scored a run in the third as Clemensen knocked in Nick Azar (Fy., Edina, Minn.). The Vikings took their first lead of the day in the bottom of the frame on two hits, a walk, and a sacrifice fly for a pair of runs, but just as in game one, there would be only one inning of offense for the home squad. Gustavus immediately responded in the fourth as Leer knocked in Matt Berkner (Sr., Sleepy Eye, Minn.) with a single and Azar followed with what proved to be the game-winning hit, plating Ethan Mocchi (So., Champlin, Minn.) on a single. Panning added another run with a sac fly and Clemensen made it a 5-2 advantage with a single to score Azar. The final run of the game came in the fifth as Mocchi plated Jack Hanson (Fy., Minnetonka, Minn.) with another single. Christian Johnson (So., Buffalo, Minn.) posted a quality start for the win, going six innings with two runs allowed on three hits with 11 strikeouts and one walk. Johnson’s 11 K’s marked the most single game strikeouts by a Gustavus pitcher since May 2, 2014 (Grant Soderberg). Gavyn Walsh (So., Andover, Minn.) struck out the side in the seventh. Clemensen (2-4, 2 RBI) and Berkner (2-2, R) led the team at the dish. The Gusties host their home opener at 2 p.m. Tuesday against Wartburg.